TV show dates: December 6, 2017 — present. Performers include: Tom Cullen, Pádraic Delaney, Simon Merrells, Olivia Ross, Ed Stoppard, Sabrina Bartlett, Julian Ovenden, Jim Carter, Bobby Schofield, Sarah-Sofie Boussnina, Sam Hazeldine, and Nasser Memarzia. From creators Don Handfield and Richard Rayner, the Knightfall TV show is a fictional historical drama set in the Middle Ages. The story kicks off in the year 1291, as the Knights Templar lose their last Holy Land stronghold — the City of Acre. The battle claims the lives of many of their order and the Holy Grail is lost, seemingly forever. Fifteen years later, in Paris, Templar Knight Landry (Cullen) grows restless as the Templars bide their time in Europe, when they should be fulfilling their mission to protect pilgrims to Jerusalem. Soon, his mentor Godfrey (Hazeldine), the Master and Commander of the Paris Temple, is struck down by highwaymen. With his dying breath, Godfrey instructs a young farmer, Parsifal (Schofield), to return to Paris and tell Landry that he will know what to do. Inside the hilt of his sword, Godfrey has hidden a message pointing his brothers toward the very Chalice of Christ. When Landry was just a boy, he ran away from the orphanage to serve as Godfrey’s squire. The elder knight trained him in all aspects of service as both a warrior and a monk. Losing Acre and the Grail shook Landry’s faith in God and in himself. Upon receiving his mentor’s final message, this high-minded, brave, and stubborn Knight Templar once again dares to hope. In turn, his hope spurs the Templars to undertake a new, bloody journey. The Templars’ most gifted swordsman, Gawain (Delaney) was permanently injured in the Siege of Acre. Now unable to do battle, he finds his loyalty to the Order waning, along with his physical prowess. Unlike most of his fellow Templars, Tancrede (Merrells) was once married, but abandoned domestic life for the Crusades. Courageous, dedicated, and tenacious, Tancrede values his sacred vows to the order above everything else and believes he should succeed Godfrey as leader. Their new quest to recover the Grail will reveal to him what part he is meant to play. Known as “King Philip the Fair” for his striking countenance, Philip IV of France (Stoppard) grapples as both a monarch and a husband. He desires to be a good ruler and increase France’s power, but is trying to figure out how to control his family, all the while balancing political finesse with power plays. His wife, Joan of Navarre (Ross), is both the Queen of France and Queen Regent of Navarre. A powerful woman in her own right, Queen Joan is caring mother, daunting diplomat, and sharp strategist. A practical utilitarian, William De Nogaret (Ovenden) serves as Philip’s lawyer and righthand man. Having watched his own parents burned at the stake for heresy, this ardent atheist is on a quest of his own — to render organized religion powerless. Finally, there is Pope Boniface VIII (Carter). Steady and honest, the Pope serves as a counterbalance to the corrupt and turbulent medieval world. The Templar Knights recognize him as their God-given leader and trust that they should follow his orders. 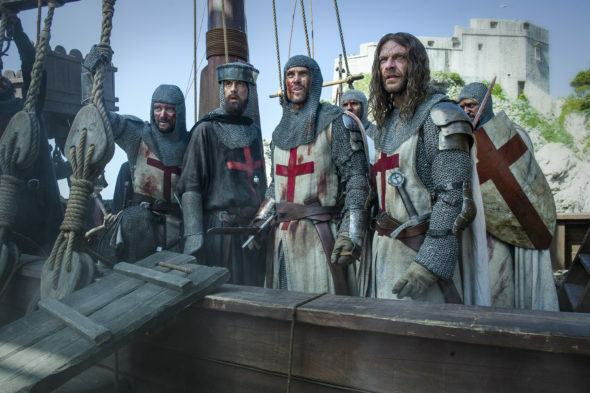 Now that a clue has surfaced steering them toward the recovery of Christendom’s most precious relic, Landry will lead the Knights Templar on a risky mission to retrieve the Grail. Whether waging war in the Holy Land or in conflict with the king, they’re rushing headlong toward the eventual demise of the Templar Order. The period drama examines themes including faith, sacrifice, power, politics, love, loyalty, and vengeance. It is through these lenses that Knightfall delves into who the Knights Templar really were, how they lived, and why they fought and died. What do you think? Do you like the Knightfall TV series? Should this TV show be cancelled or renewed for another season on History?